This rain is not going to stop us from eating healthy and keeping our spirits up! Sweet potatoes can add DELICOUS to any meal. 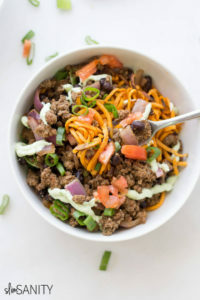 For softer sweet potato noodle bowls: After simmering ground beef with taco seasoning, add sweet potato noodles to the same skillet with a swirl of EVOO and another ¼ cup water. Cook on low about 7–10 minutes until sweet potato noodles are soft. You may need a kettle/larger skillet than normal for this. Take it to the next level: Serve with black bean puree on the bottom! To make puree, blend additional cup of black beans with ¼–1/2 cup of water to the correct consistency with an extra teaspoon of taco seasoning. Nutrition facts based on 4 servings of recipe with no black bean puree. To be fair, I’d say this recipe lasted us closer to 6 servings, but included avocado, Greek yogurt and black bean puree as well.